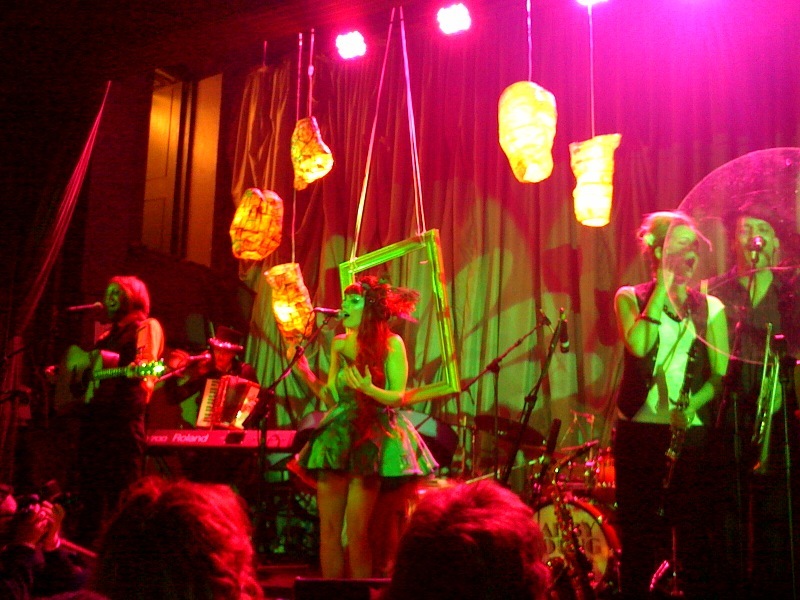 The Venue, Bloomsbury Ballroom, is an impressive room in itself, but was made even more special for the gig with the stage and hall decorated by many of Gabby’s talented arty friends. There were also more stalls, which in honesty were not something that appealed to me personally (the music was the main attraction! ), but they certainly made it feel like more of an event, and seemed to go down well with much of the crowd. Taking advantage of their hefty brass section, the band opened with ‘The Pink Panther’ theme, a fun way to start proceedings, and a good build up to Gabby’s appearance on stage to unveil her latest dress creation. Known as much for her involvement in the fashion world as much as music these days, her outfits are always bold and inventive. Naturally the set still focused heavily on the band’s debut album ‘We’re All In This Together’, but had also grown somewhat since the album launch. In addition to the Pink Panther intro, the encore featured a cover of Cab Calloway’s ‘Hi-De-Ho’, a favourite song of Gabby and her father’s which she has always wanted to sing. The ‘Hi-Di-Hi’ call and response sections were led by guitarist and vocalist Stephen Ellis, with some fun variations. We were also treated to a fantastic new song ‘Horatio’, the intro to which is featured on the album, just as a snippet. Of course the now well known tracks from the album went down great with the crowd, with lots of singing and dancing along to ‘Ask You A Question’, ‘Ladies Of The Lake’, and the new single ‘Ones That Got Away’. 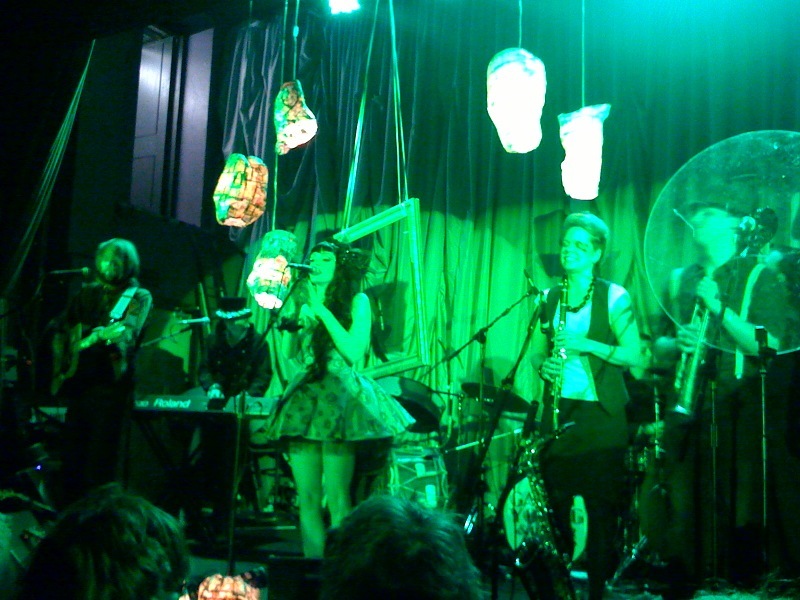 A steel band joined in for ‘Lipsink’, and the banjo-led title track of the album demonstrated the stripped-back, more mature side of the band. The packed crowd was an impressive sight, demonstrating how well Gabby and the band’s profile has grown over the past 6 months, no doubt helped by the press coverage received for her ‘Become an Animal‘ scheme. 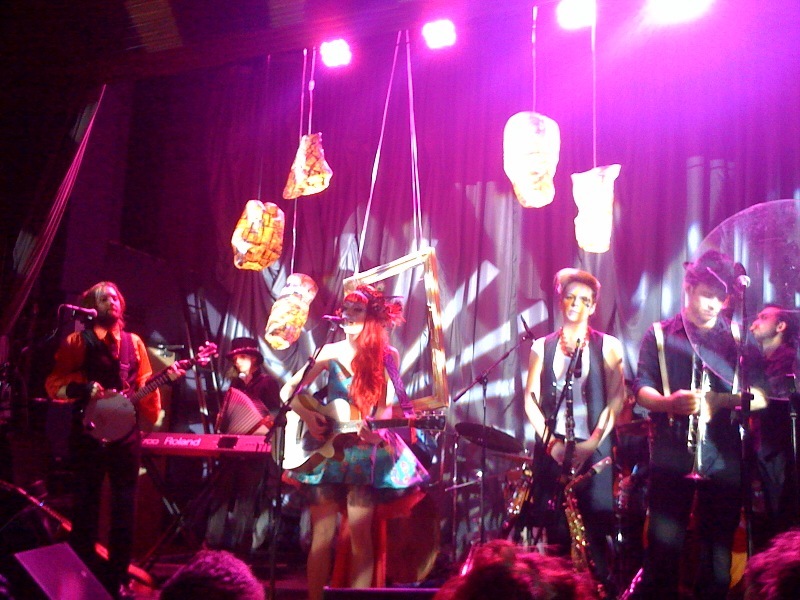 This growing love for the band was demonstrated when one song was dedicated to Iris – an 80 year old fan who danced her way through the whole set and seemed to know every word, wearing a Gabby Young tshirt, and waiting to her CD signed at the end. All in all a superbly fun evening, and reassuring to see such a talented young artist and band get the recognition they deserve. “Will we make it on to Gareth’s Gigs?” I was asked by Gabby after the gig. Of course – you just did! This entry was posted in Gig Review and tagged Bloomsbury Ballroom, Gabby Young, Gabby Young & Other Animals, photos, review, We're All In This Together. Bookmark the permalink. Very good review! Shame every photo chosen has everyone but the trombonist (me) in it! Cheers Yusef! And sorry I missed you – only had my phone cam so hard to fit everyone in + you were behind the perspex screen! Will make sure you make it into my pics next time. Nice work on Pink Panther btw 🙂 Used to play trombone myself but haven’t for a few years now – makes me miss it when I see you guys play!